RinTinPin was created by artist Laura Thornhill. The pins are one-of-a-kind wearable art pieces composed of vintage materials from the Victorian era through the 1920s, 1930s and 1940s. 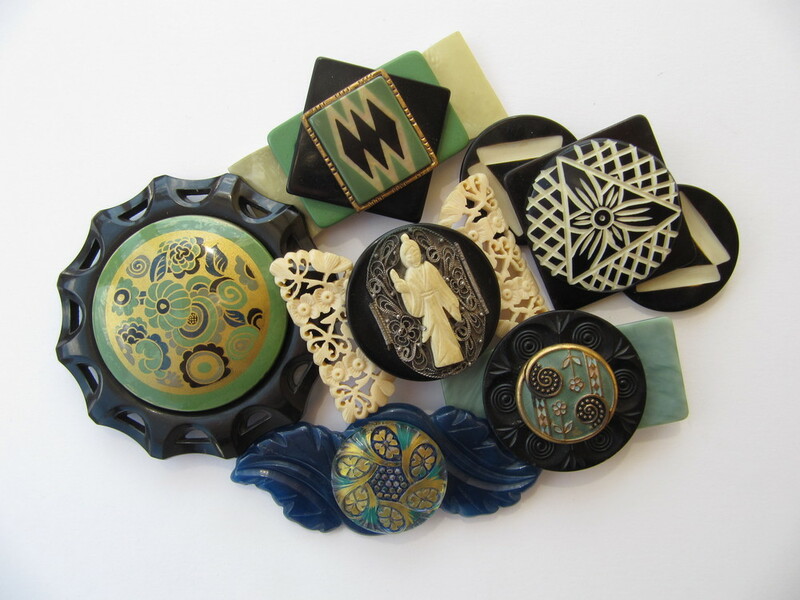 Each pin is an assemblage of antique buttons, buckles, and jewelry findings made of original bakelite, celluloid, various metals and glass. Designs vary from Art Deco, Nouveau and Asian influences to decorative florals. Some are whimsical, some romantic. RinTinPin has been in existence over fifteen years. The average size of the pins is 2.5 inches to 3 inches wide. Laura Thornhill, designer of RinTinPin, is trained as a fine artist. She says that her pin designs remind her of many collages she’s created, working with unusual shapes and colors. For several years, she was a fashion stylist, dressing models and celebrities. During this time, she became passionate about vintage fashion and jewelry, and started designing with antique buttons and buckles to create one-of-a-kind brooches. RinTinPin was born. Now these wearable art pieces are collected by people everywhere.